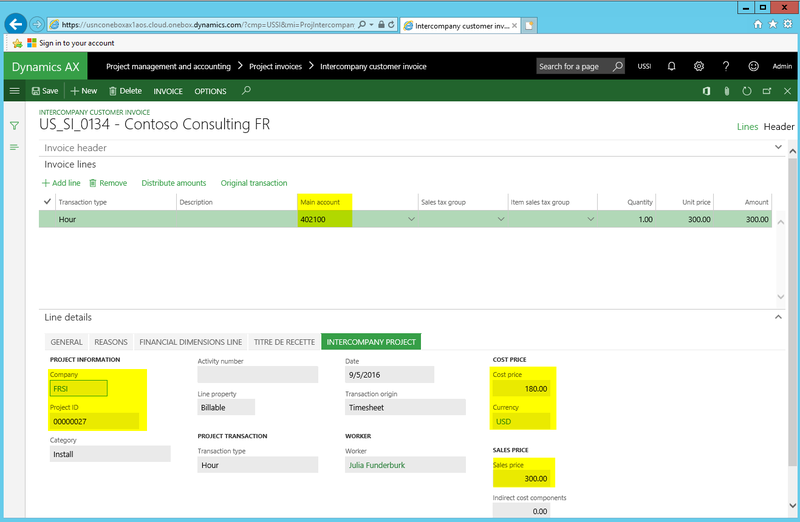 In this post I demonstrate how MS-Flow can automatically create intercompany vendor invoices based on free-text invoices that have been created in another D365FO company. The underlying scenario for the subsequent illustrations and explanations is the development of a software product by the corporate headquarter company that requires regular updates and maintenance e.g. in order to comply with changes in legal regulations. The initial development of the software product was completed by a team of developers from the corporate headquarters company (USSI) several years ago. All costs related to this product development were recorded on an internal development project U1 that was closed after the initial product development ended. Thereafter, all costs related to product updates and changes are tracked in a separate project U2. In order to run & treat the internal product development team as a profit center and not a cost center, the corporate management decided that the subsidiaries that make use of and sell the software product need to pay a fraction of their sales revenue to the corporate headquarters as a license fee. All respective intercompany contracts have been signed and need to be applied in the ERP system. 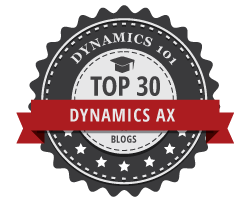 How this application can be realized in standard Dynamics AX will be subject of this post. Before digging into details, let’s have a quick look at the following illustration that shows the different companies and projects involved in this scenario. Similar what has been shown in the prior post on intercompany costs allocations, the first thing that needs to be setup are intercompany dummy vendor accounts. 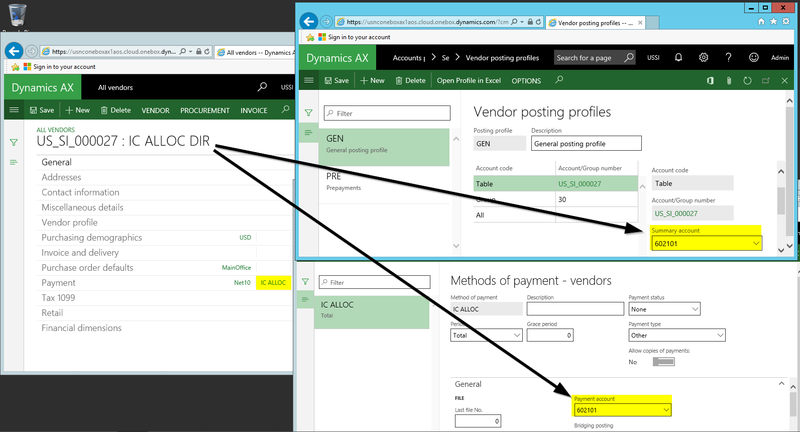 The only difference to what has been described in the previous post is that two rather than a single dummy vendor account need to be setup. The second setup step is also identical to the one shown in the prior post. However, slightly different from before, intercompany customer accounts need to be setup in the subsidiaries FRSI & GBSI and two separate intercompany vendor accounts in the corporate headquarters company USSI. 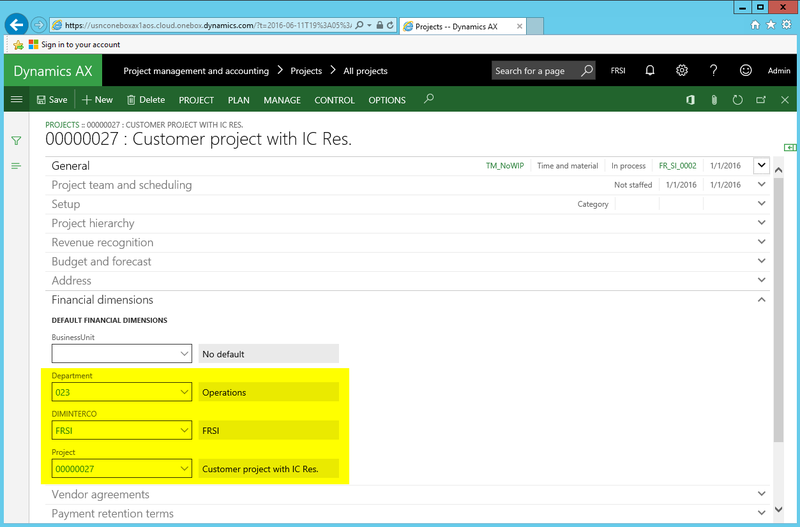 The third setup step relates to the project category setup, which is required for the intercompany invoicing and transaction recording. Different from before, this time, two separate project categories – one for each subsidiary – need to be established because the project ledger posting setup in the project module does not allow a separation based on the company account. 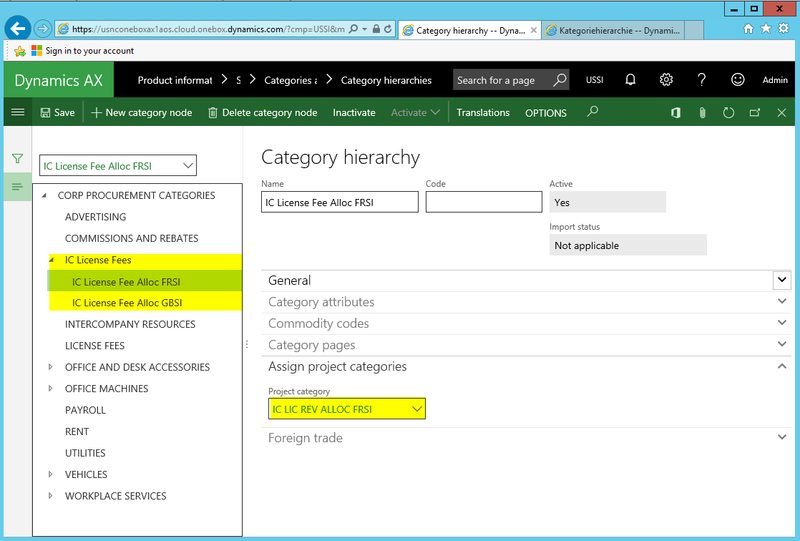 Please note both categories are linked to the transaction type “expense”. Also the setup of the procurement categories is mainly identical to the setup that has been shown in the previous post except that two rather than a single procurement category need to be setup – one for each subsidiary. The project setup in the different companies involved in the intercompany scenario follows the structure shown in the graphic of the initial scenario section above. The next screen-prints exemplify how the corresponding projects are setup in the headquarters (USSI) and subsidiaries companies (FRSI & GBSI). As mentioned in the prior post on intercompany cost allocations, there is nothing that requires special attention when setting up the different projects except that each of those projects should be linked to a default intercompany financial dimension value – at a minimum. In regards to the project posting setup, reference can be made to what has been mentioned in the prior post except that the direction of the setup is flipped. That is, while intercompany revenue accounts need to be setup in the subsidiary companies (FRSI & GBSI), intercompany cost accounts need to be setup in the headquarters company. 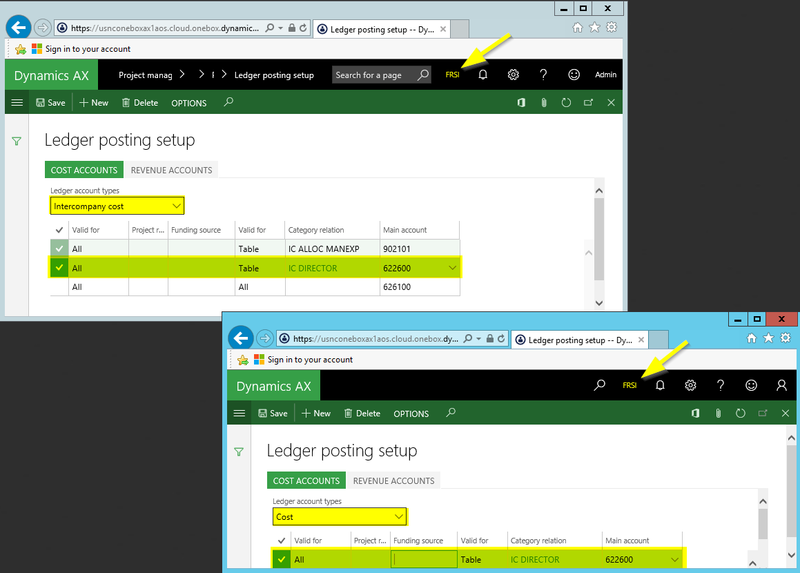 The same holds for the setup of the ledger posting integration for the procurement categories. Against the background of those setups, the first process step consists of recording costs and revenues on the external customer projects that are run in the subsidiary companies. For reasons of simplicity and brevity only hour transactions are recorded and subsequently invoiced for a single project in each of the subsidiary companies. The next screen-print shows the vouchers created in company FRSI for the time recorded and invoiced. As the vouchers created in company GBSI are basically identical to the one created in company FRSI, they are not explicitly illustrated here to conserve space. 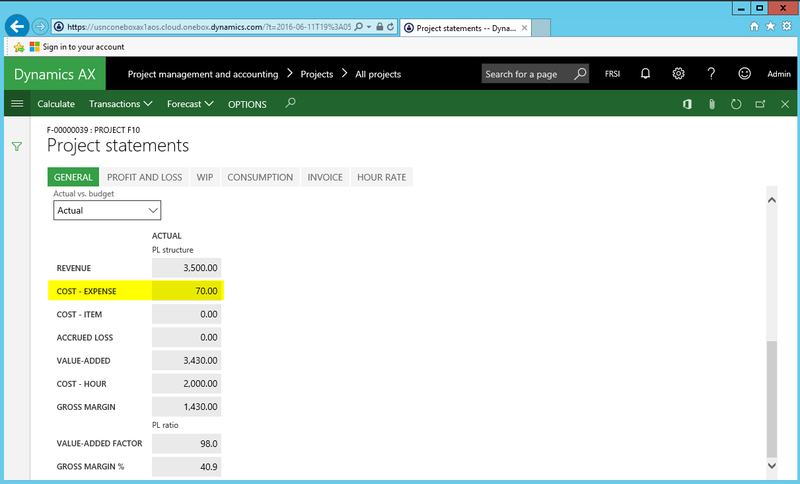 They are, however, included in the next accounting overview. 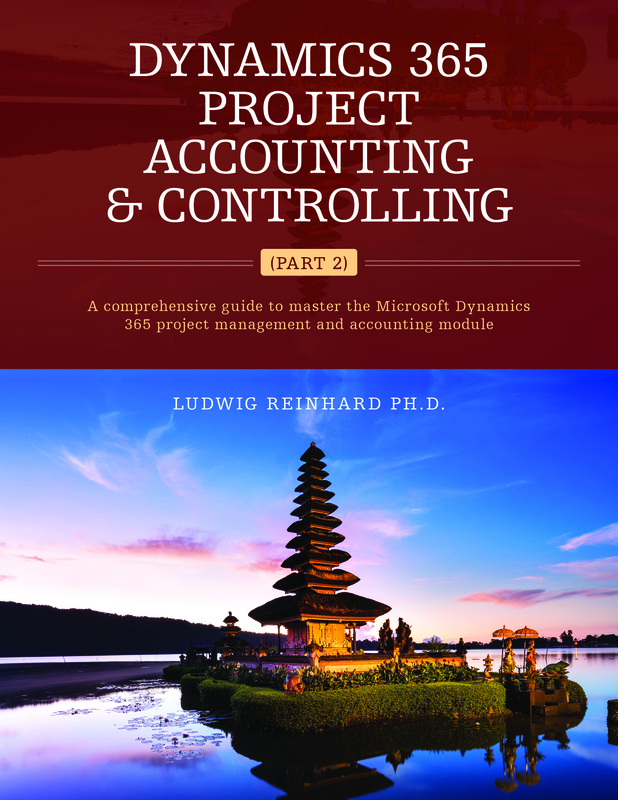 The prior accounting overview shows ordinary project accounting transactions that debit a project cost account for the hours recorded and credit the payroll allocation account for the cost of those hours recorded. The second vouchers record the receivable against the external customer and credit a project revenue account (highlighted in yellow color). Whereas most of you have seen and are familiar with the first process step, you might not have seen the following second one that posts an internal transaction on a dummy vendor account. Slightly different from the prior post where only a single line was used to create a transaction on the internal dummy vendor account, this time two lines are recorded and posted. The first line is used to record an expense on the external customer project – in the screen-print below – in company FRSI. This expense transaction represents the license costs charged by the corporate headquarters to the subsidiary for using the developed software product. The second line is used for the subsequent creation of the intercompany credit note and consequently entered with a negative quantity & amount. Please note that this second line links to the support & maintenance project in company USSI. Note: Whereas recoding such internal transactions is feasible in situations where a limited number of external customer projects exist, it becomes infeasible in companies that run many external customer projects. 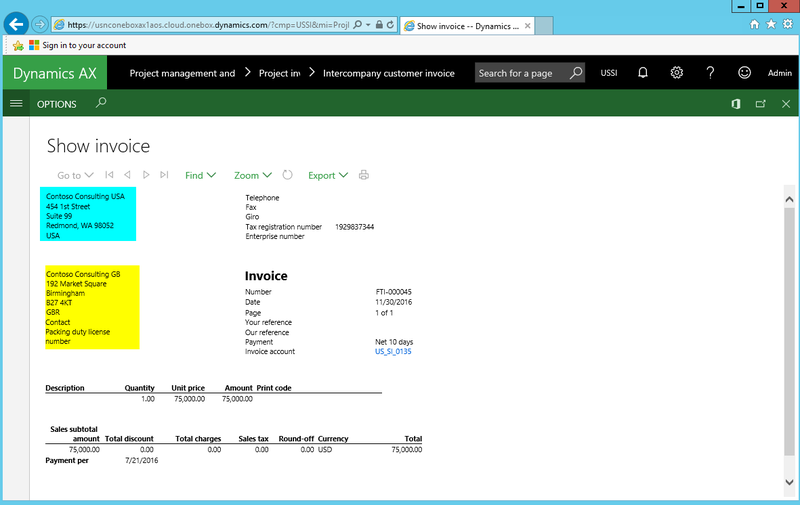 What might help in those cases is the standard Excel-Addin for Dynamics AX that allows importing transactions into the invoice workbench form shown above. 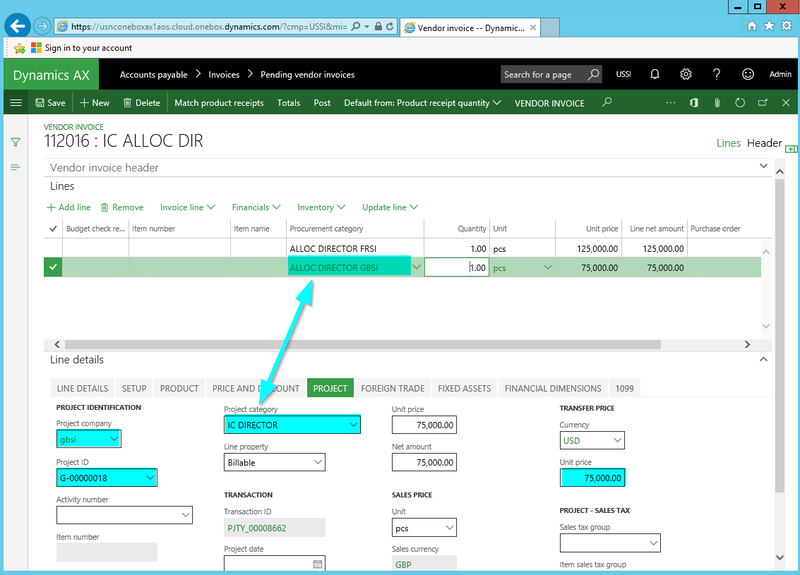 The voucher resulting from posting the internal transaction can be identified in the next screen-print and is summarized in the next accounting overview. The first notable outcome that can be identified from above is that no open vendor position is created on the internal dummy vendor account, as the two lines recorded offset each other. 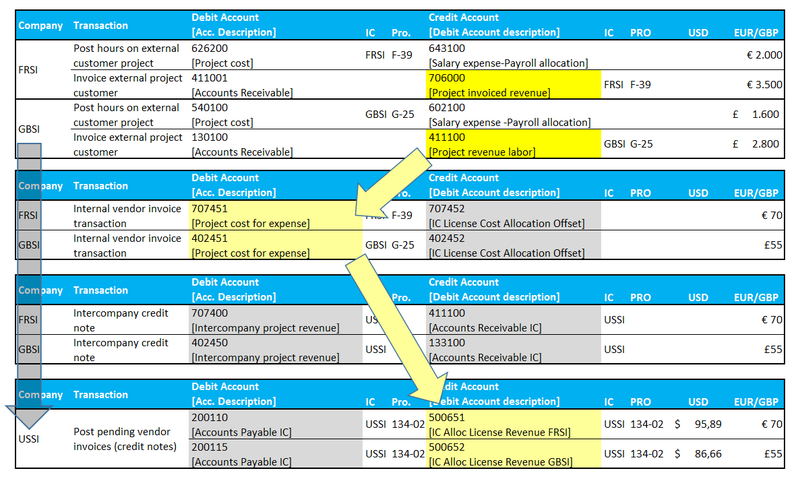 In addition, the debit account transaction on the ledger accounts 707451 (FRSI) and 402451 (GBSI) – that represent the license costs for the use of the software product developed by the corporate headquarters (USSI) – lower the profit for those projects and allow project managers taking a look at the full costs of their projects. The next screen-print, which shows the project statement for the external customer project in company FRSI shows this in more detail. The third process steps consists of creating the intercompany project invoices (credit notes) in company FRSI and GBSI. As this step mirrors the one shown in the previous post, reference can be made to what has been said there. The voucher that results from posting the intercompany project invoice (credit note) can be identified in the next screen-print. As before, the next accounting overview summaries the postings recorded thus far. Please note that the accounts highlighted in light-grey color offset each other and do thus not exert an influence on the project and corporate profitability in the subsidiary companies. The last process step described in this post consists of posting the pending vendor invoices (credit notes) in the corporate headquarters company USSI shown in the next screen-print. Posting those credit notes results in vouchers that debit – and therefore reduce – an intercompany liability account and credit an intercompany P&L account. For that reason, the profit in the corporate headquarters company increases correspondingly. 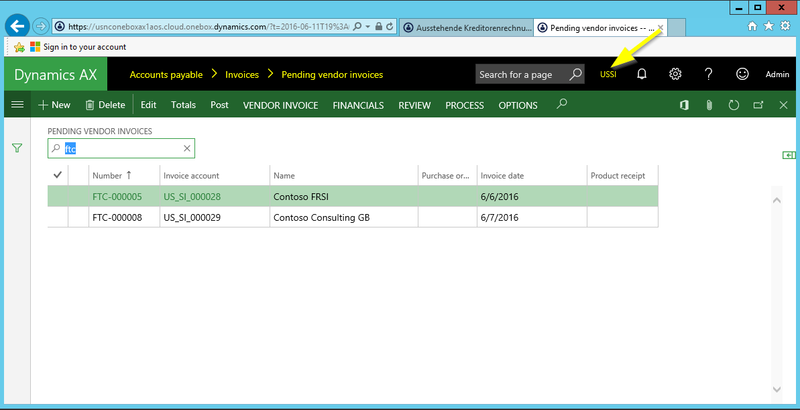 The next accounting overview summarizes all transactions recorded within the four process steps shown above. The yellow-highlighted arrows and fields illustrate that a part of the revenue from the external customer projects in the subsidiaries (FRSI & GBSI) is shifted to the corporate headquarters company that developed the overall software product sold to the customer. With this revenue shifted to the support & maintenance project in the headquarters company, a comparison of the initial development cost and the ongoing maintenance costs of the developed software product with the resulting license revenues can be made. This is a major prerequisite for treating the internal development team / project as a profit center. 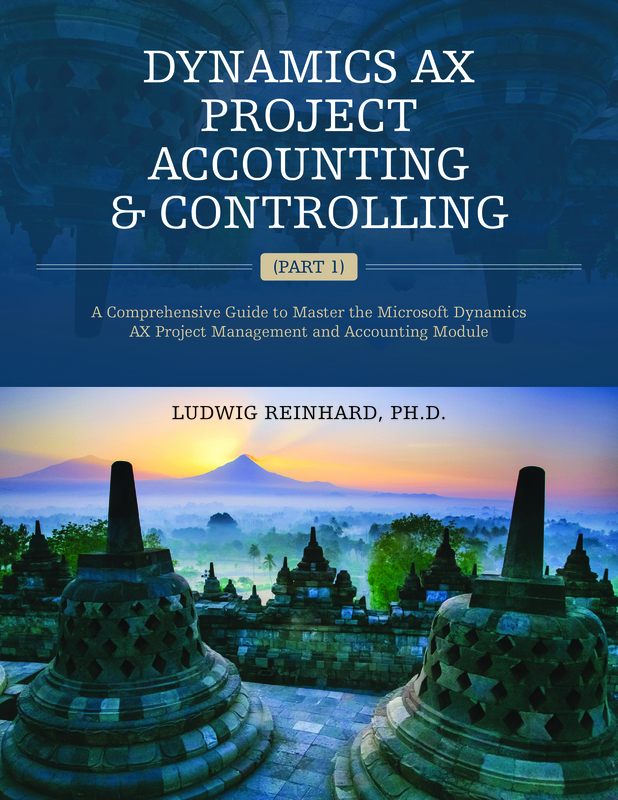 Within this and the previous posts I illustrated how indirect costs can be allocated to projects – either within a single company or between companies – by using standard Dynamics AX functionalities. 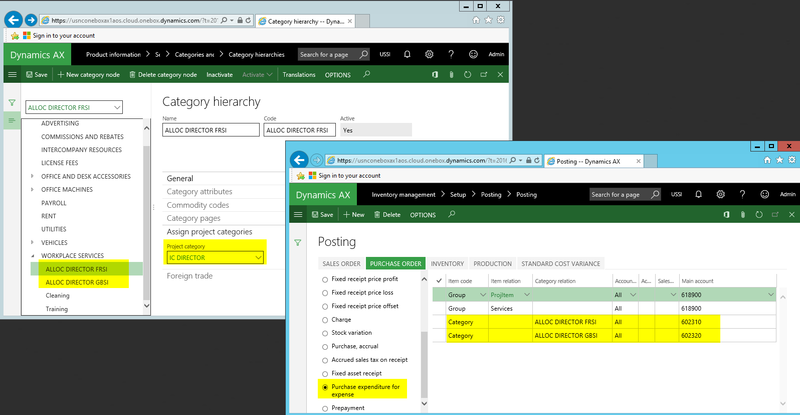 The major outcome of those posts is that the standard Dynamics AX tools do in general support all kinds of those project allocation scenarios require, however, the one or the other system modification in order to get the allocations fully automated. The prior post introduced the standard project intercompany functionality for time sheet transactions. Within this post I would like to modify and extend this scenario by analyzing how the costs of corporate directors can be allocated to projects in other legal entities that they – at least from time to time – supervise. An underlying assumption of this scenario is that the directors do not record their time in Dynamics AX but rather that only their salary expense is recorded in the corporate headquarters company (USSI). The next graph illustrates the corporate structure used for the following illustrations and shows that the director’s salary expense shall (partly) be allocated to the projects setup in subsidiary FRSI and subsidiary GBSI. Note: What is important when it comes to the allocation of indirect costs across different legal entities is that regulators / tax authorities regularly require tax invoices and the adherence to international transfer pricing regulations to prevent companies from shifting their profits to low tax countries. This is an aspect that will also be taken into consideration subsequently. For the following illustrations I will use an approach similar to the one introduced in an earlier post. That is, the cost of the corporate directors will first be invoiced and recorded on company-specific summary projects (F0 and G0) from where they will be allocated to the different projects in a second process-step. The next graph illustrates this procedure from a high-level perspective. In order to implement this scenario, a couple of setups are necessary that I will illustrate next before having a look at the different process steps involved. The first thing that needs to be setup for the illustration of this scenario is a dummy vendor account in the corporate headquarters company USSI that will be used as an intercompany invoice “vehicle”. Three things require special attention when setting up this dummy vendor account. First, the use of a Profit & Loss (P&L) summary account No. 602101 that is used as the offset account for the cost allocations recorded. 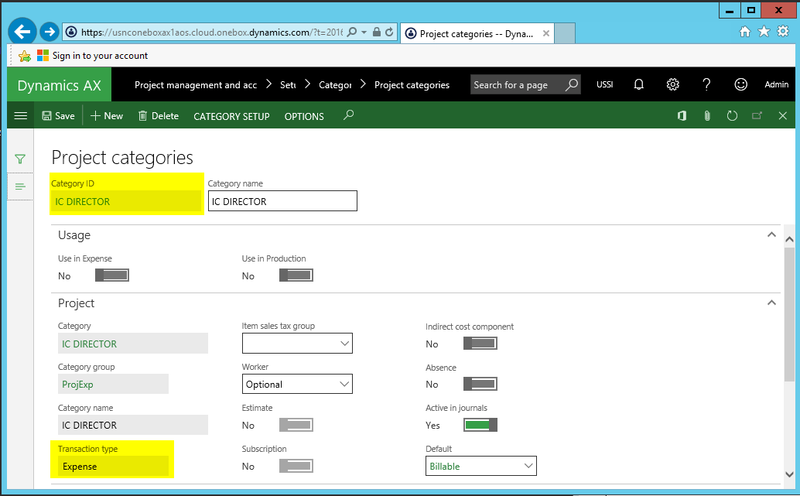 Second, the (optional) setup of a separate method of payment for this dummy account to avoid an unlimited increase of the dummy vendor account balance and third the (optional) linkage of the summary account to fixed financial dimension values that offset those financial dimensions that will be used when recording the directors salary expenses in Dynamics AX. Once the dummy vendor account is setup in the headquarters company, intercompany customer and vendor accounts need to be setup in all companies participating in the intercompany scenario. 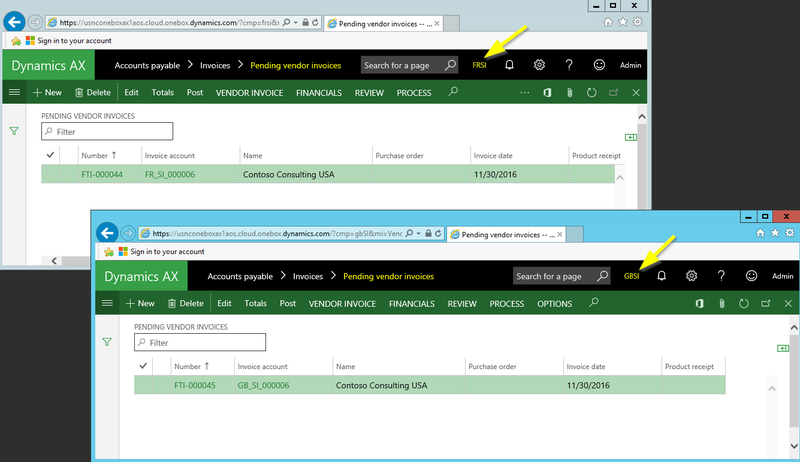 When setting up those intercompany customer and vendor accounts it is important that an intercompany financial dimension value is setup as default value, as exemplified in the next screen-print. Otherwise, the financial consolidation process of the corporate ledger accounts might get difficult later on. The third setup is related to the project category that will be used for the intercompany invoicing and allocation of the director’s costs. There is nothing special to look out for when setting up this category except that it is setup in all companies. 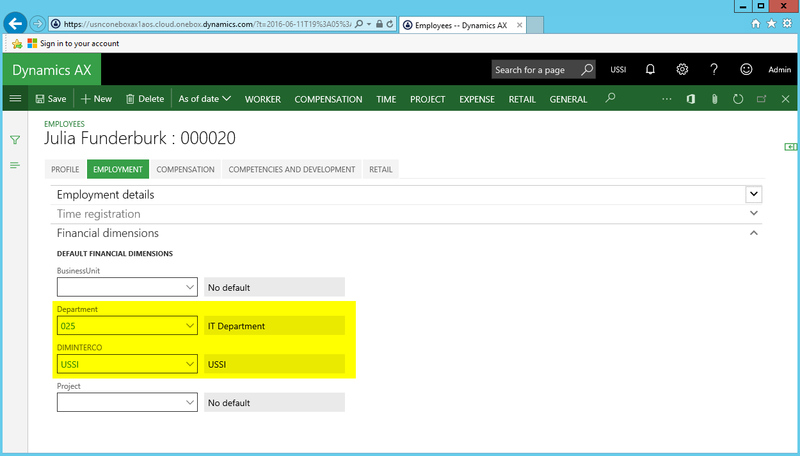 Please note that I linked the IC Director category to the transaction type “expense”. 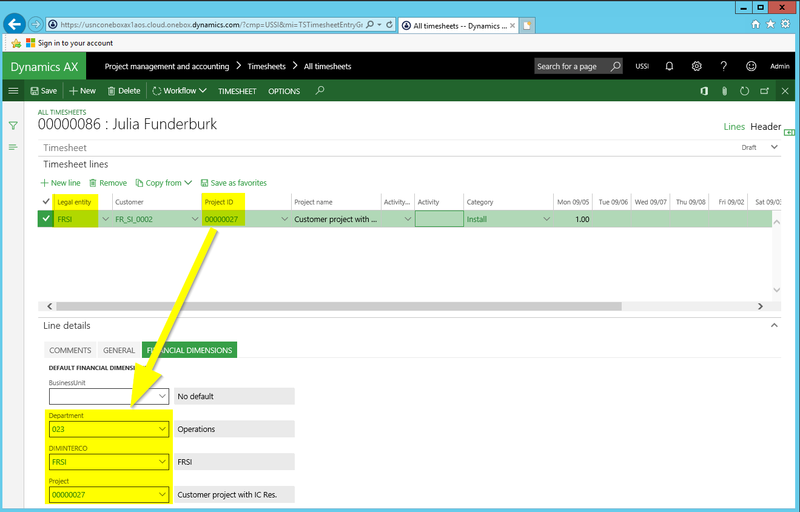 After the project category setup is finished, procurement categories need to be defined that will be used for creating the intercompany postings later on. 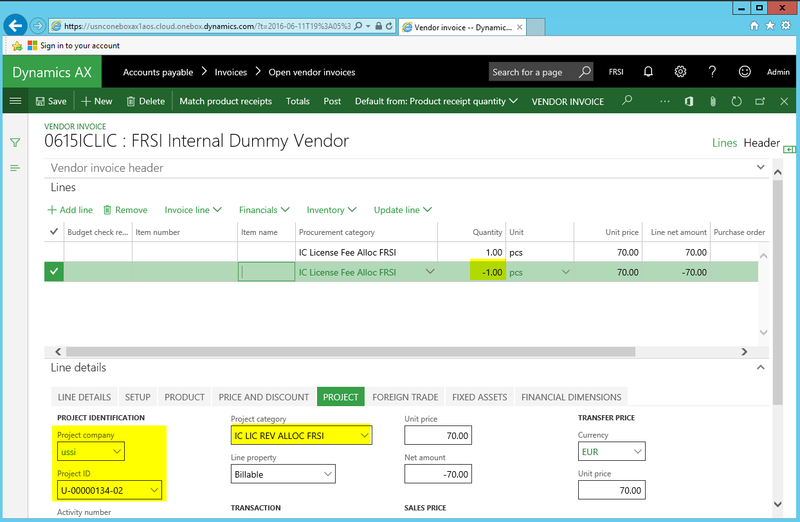 When I setup those procurement categories, I noticed that Dynamics AX summarized my transactions irrespective of the financial dimension values used. For that reason, two – rather than a single – procurement categories will be used in the following. 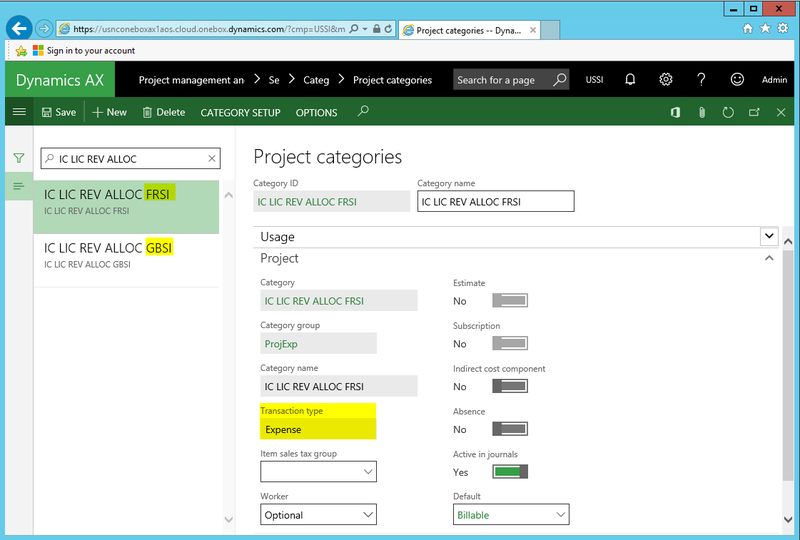 Please note that both procurement categories are linked to the same project category that has been setup previously. To record project transactions later on based on those categories, corresponding ledger accounts need to be setup in the inventory posting matrix. 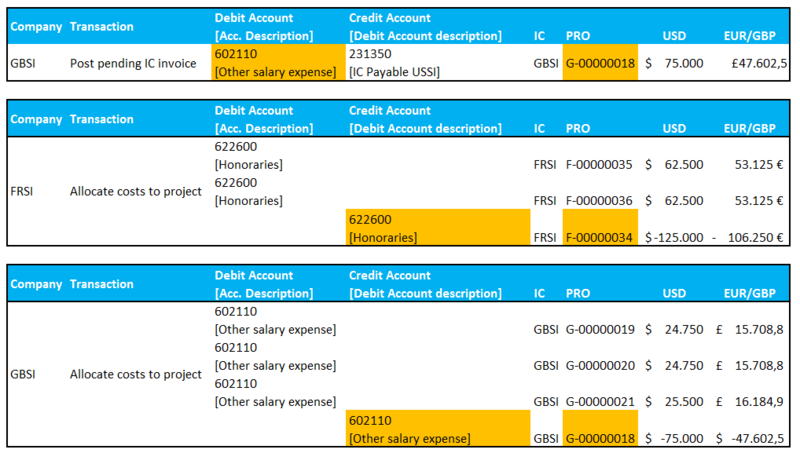 In the example illustrated above, the ledger accounts 602310 and 602320 represent intercompany P&L salary allocation accounts. Details for their usage can be investigated further below. No specific setup is required for the internal (allocation) and external customer projects in the subsidiaries except that one should ensure that they are all linked to a default intercompany financial dimension value at a minimum. The last setup required relates to the setup of the project ledger posting. In this respect you have to setup an intercompany revenue account in the corporate headquarters company that allocates the costs to the different subsidiaries. To get those allocated costs posted in the subsidiaries, the subsidiaries require the setup of intercompany cost accounts. 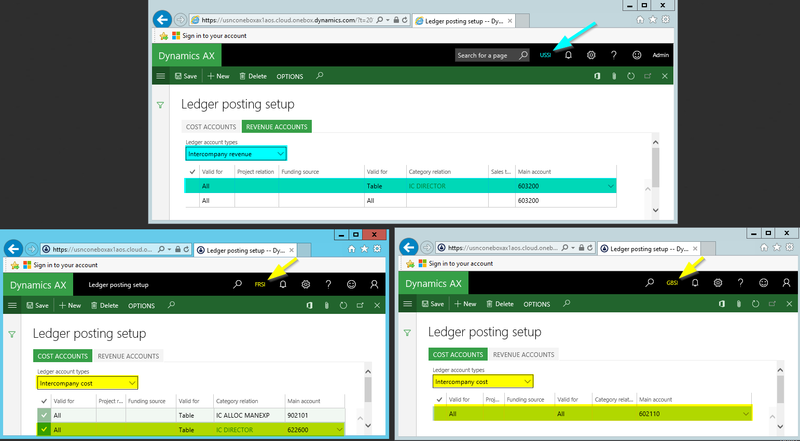 The next screen-print exemplifies the ledger posting setup required in the different companies involved. (Please note that the corporate headquarters company USSI and the subsidiary GBSI share the same Chart of Accounts (COA). The FRSI subsidiary does, on the other hand, use its own local COA). In addition, as the allocated intercompany costs will subsequently be distributed to the different external customer projects by making use of the project adjustment functionality, one has to ensure that the intercompany cost account setup is also made in the project costing section. That is because the latter posting type will be used for the distribution of the costs to the different projects. Note: The project ledger posting setup shown above is based on the use of time & material projects. If you use other project types, a slightly different ledger posting setup might be required. With all those setups in place, the intercompany cost allocation process can start with the recording of the directors’ salary expense – for reasons of simplicity – in an ordinary General Ledger journal. Please note that I recorded the salary expense together with a business unit and department financial dimension value. The voucher resulting from this transaction debits a P&L account and credits the Balance Sheet (BS) account that records the salaries payable. The next step involves a pure internal transaction that is required for the subsequent generation of the intercompany invoices. This internal process step involves recording an internal vendor invoice on the dummy vendor account setup and makes use of the previously setup procurement categories. In the example used and illustrated in the next screen-print, a total of 200k USD is allocated to the other companies (125k USD to company FRSI and 75k USD to company GBSI) involved in the intercompany relationship. Please note that the internal invoice transaction is made in reference to the intercompany project category and summary project as shown in the next screen-print. 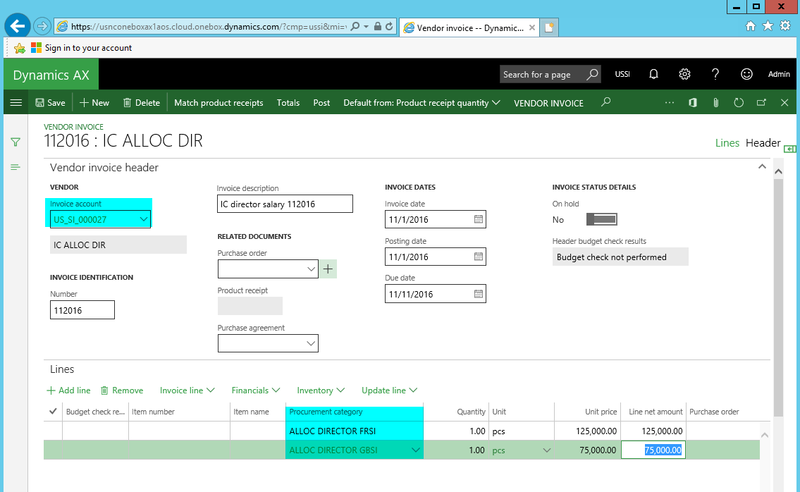 … which is summarized in the next accounting overview. What one can identify from the illustration above is that – due to the specific ledger accounting setup made – the internal invoice transaction does not influence the overall profitability of the corporate headquarters company USSI because the ledger accounts used for the debit and credit transaction are both P&L accounts. From an overall accounting perspective, the only thing that has changed through this internal invoice transaction is that the total corporate directors’ salary expense is broken up into different parts. 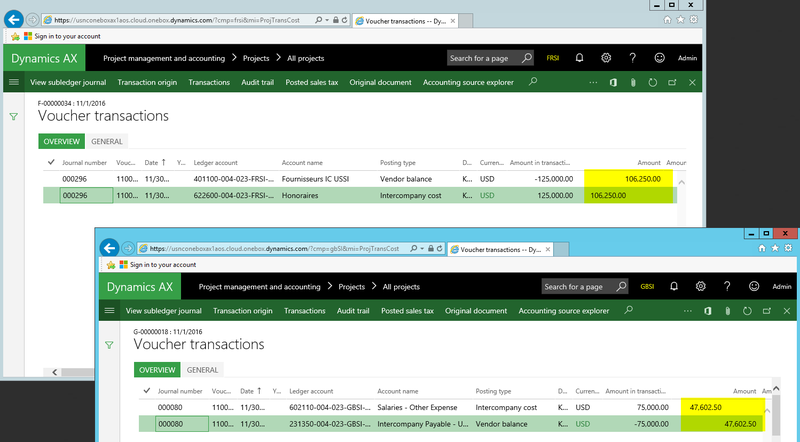 Part 3: 75k USD – recorded on ledger account 602320 – that will subsequently be invoiced to company GBSI. 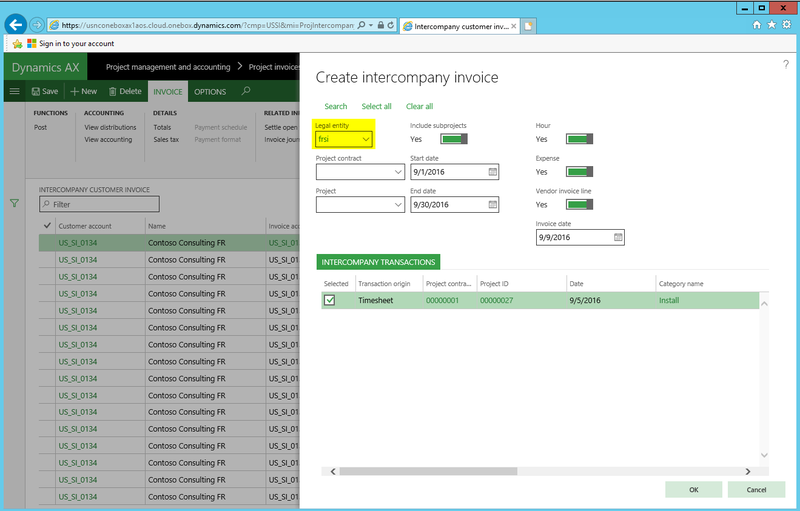 Once the internal invoice transaction is recorded, the intercompany project invoices can be generated. This is realized through the standard Dynamics AX intercompany project functionality illustrated in the next screen-print. A major advantage of using this standard functionality is that the intercompany invoice document is – as exemplified in the next screen-print – automatically created out of the box. The voucher resulting from this intercompany invoice transaction debits an intercompany receivable (BS) account and credits a P&L account that offsets the previously recorded expense allocation accounts. 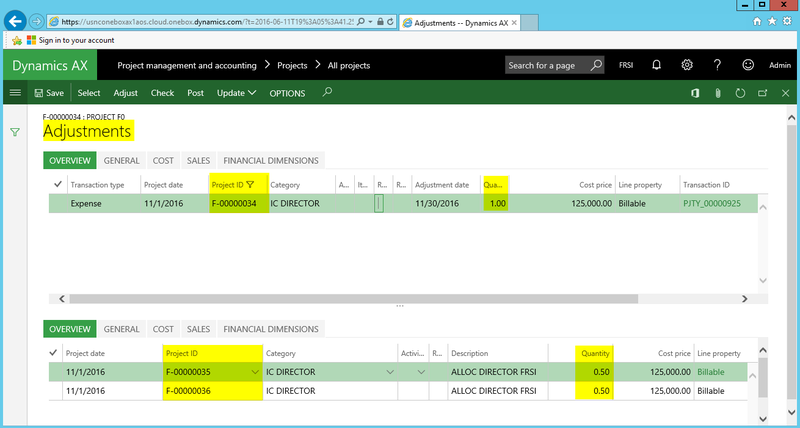 The next accounting overview illustrates the offsetting effect mentioned above in the yellow highlighted accounting sections. Due to this offsetting effect the total directors’ salary expense remaining in the corporate headquarters company is reduced from 300k to 100k USD (sum of the ledger accounts 602100, 602310, 602320, 602101 and 603200). At the time the intercompany project invoice is recorded in the corporate headquarters company, pending Accounts Payable vendor invoices are automatically created in the subsidiary companies FRSI and GBSI. Please see the next screen-print. Please note that the voucher recorded in the subsidiary companies record the transaction in USD – the currency that was specified when posting the intercompany invoice – and the accounting currency of the subsidiary (EUR resp. GBP in my case). What currencies are used for the intercompany invoicing process is not only an accounting issue but also a transfer pricing and organizational issue, as it determines which legal entity has to bear the risk of foreign exchange rate changes. 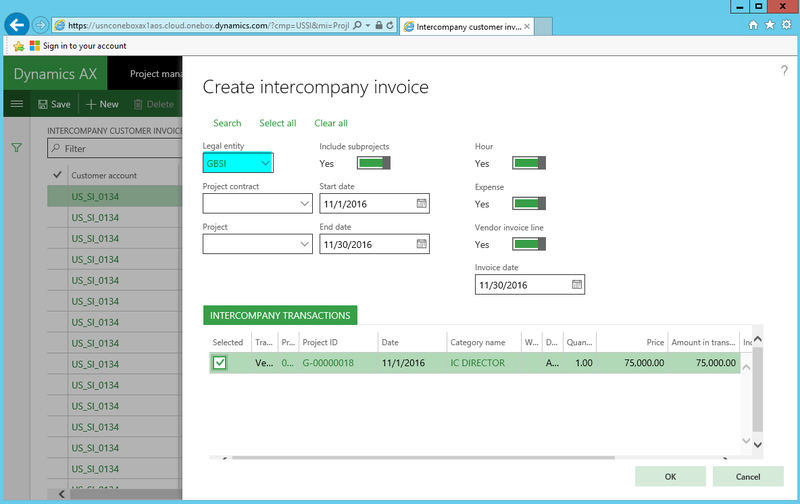 As before, the next accounting overview, summarizes the intercompany invoice transactions recorded in all companies involved in the intercompany trading relationship. One of the last steps in the intercompany allocation process is the distribution of the allocated costs to the different projects in the subsidiaries. This can be achieved by making use of the project adjustment functionality that has been introduced in a prior post and which is illustrated in the next two screen-prints. 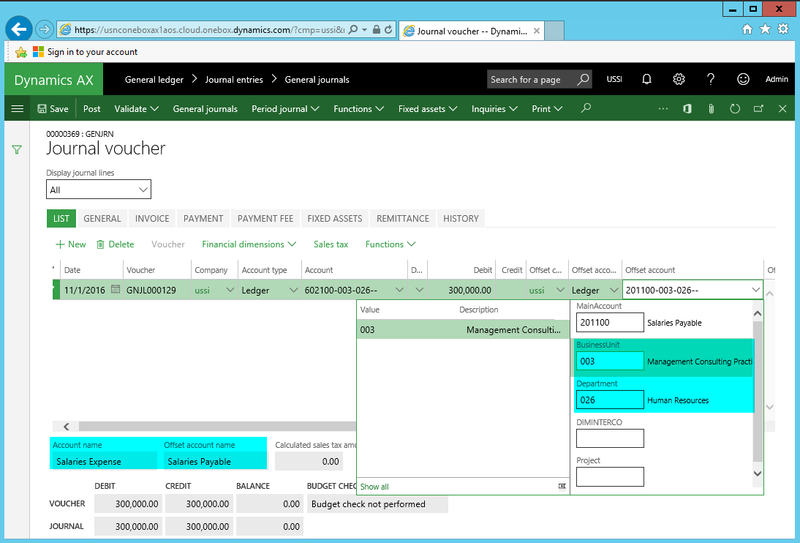 The resulting vouchers are once again summarized in the next accounting overview. As one can identify, the adjustment / allocation posting in the different companies ensured that all costs are finally distributed down from the corporate headquarters level to the project level in the subsidiaries. The remaining two process steps related to the intercompany allocation are not explicitly illustrated here, as they are not directly related to the intercompany cost allocation process. The first remaining process step is the payment of the previously used internal dummy vendor account to ensure that the balance on this dummy vendor account does not grow unlimited. Please note that this process step is optional and not necessarily required but recommended in order to alleviate the reconciliation of the Accounts Payable with the General Ledger module. The second remaining process step is the payment of the intercompany project invoices. 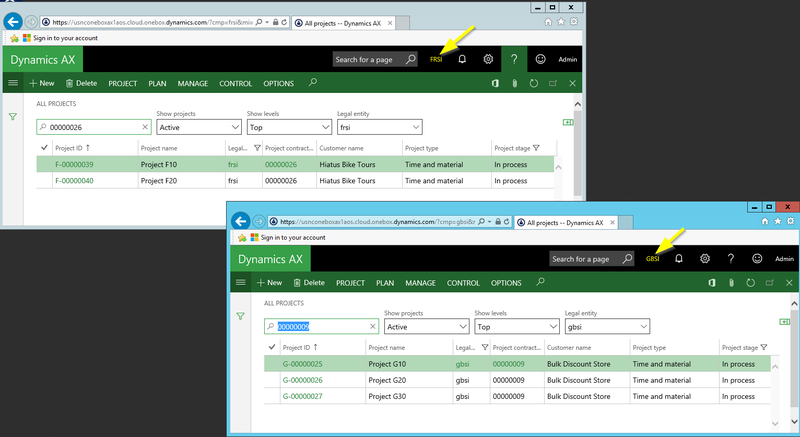 Also this process is not explicitly illustrated here as it can be realized by making use of the standard Dynamics AX payment functionalities. Within this post I illustrated how indirect costs recorded in corporate headquarters can be allocated across legal entities down to the different projects processed in the different subsidiaries. An important aspect of this process is that the required intercompany tax invoices and all required accounting transactions can be created out of the box with the standard Dynamics AX intercompany project functionalities. The next and final post in this series on project related cost allocations will focus on a scenario where costs / revenues recorded at the project level of the different subsidiaries will be allocated back to the corporate headquarter level for cost analysis purposes. In my last post I illustrated a standard functionality that allows allocating indirect costs, such as licensing costs to projects. 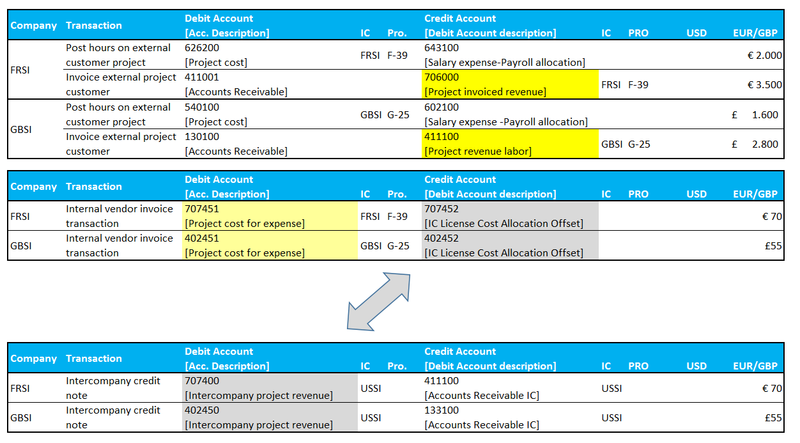 While the major focus in the earlier post was on intra-company cost allocations, I would like to extend the focus in this post by taking a look at standard functionalities that allow intercompany cost allocations for projects. Rather than trying to illustrate those functionalities from a pure technical, rather abstract perspective, I decided to take a look at project related intercompany cost allocations based on the following three examples. Within this first example I will take a look at the standard intercompany timesheet functionality that allows employees recording times on projects that are setup in different companies without having to change the company. You might have read some posts about this feature before. Yet, irrespective of that and risking that you have already heard / read about it, I would nevertheless like to start with this elementary example, as it establishes the basis for the following, more complex intercompany cost allocation scenarios. 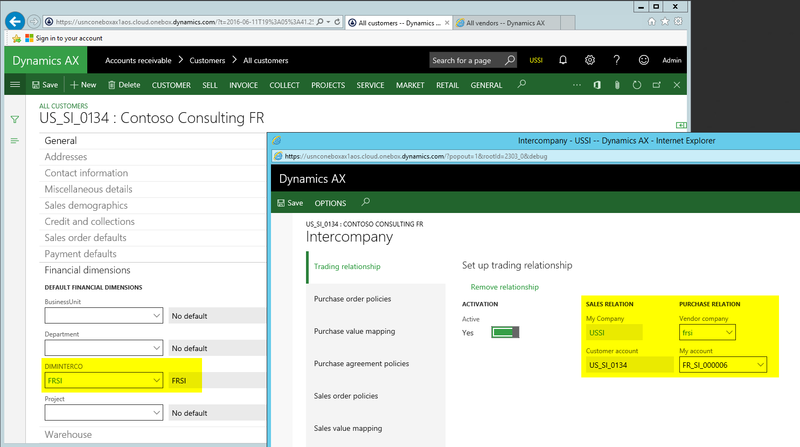 In this first example I assume that an employee engaged in company USSI is doing some software installation work for a customer project that is setup in company FRSI. In order to allow the USSI employee recording her time on the FRSI project and to charge FRSI for the hours worked, the following setup is required. The first thing that needs to be setup is an intercompany relationship between a customer and vendor account, which is required for recording the intercompany cost and invoice transactions later on. 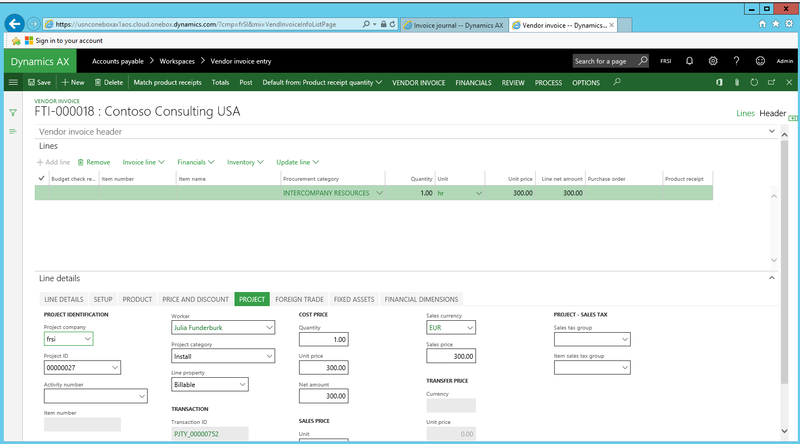 The next screen-print exemplifies this setup for the intercompany customer account in company USSI. Note: When establishing the intercompany customer-vendor account relationship you need to ensure that those accounts are setup with a financial intercompany dimension as illustrated above. That is because the project posting profiles do not allow setting up ledger accounts based on a company criteria. If you decide not making this kind of setup, the consolidation of your financial results might get more complex later on. For details, please see further below. 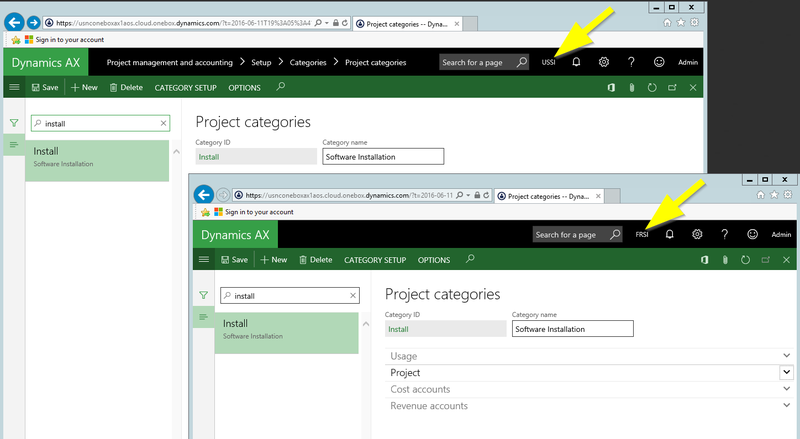 The next setup required is related to the project categories. In this respect you have to ensure that the category that you need for recording the hour transactions is setup in both companies. 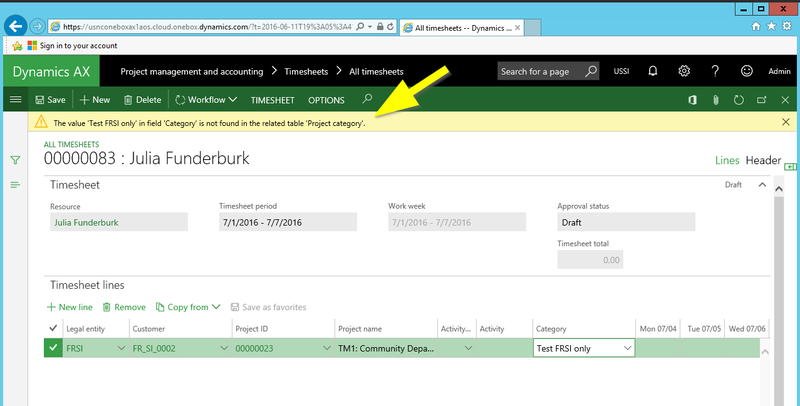 Note: If the category is not setup in both companies, Dynamics AX will show the following error message and won’t let you continue processing your transaction until the error is resolved. Once all project categories required have been setup, an intercompany accounting relationship between the companies involved in the transaction needs to be established, as illustrated in the next screen-print. Establishing this relationship is not required for creating timesheet and/or intercompany postings but rather for allowing users selecting the different companies in the timesheet form. Please note that if the intercompany accounting relationship between USSI and FRSI is missing, employees working in USSI cannot select and post their hours on projects that are setup in FRSI. The next screen-print illustrates this. When setting up the project in FRSI, it has to be ensured that the project is linked to a financial intercompany dimension. Otherwise, the separation and identification of intercompany transactions during the financial consolidation process might become difficult. Please note that the other financial dimensions used in this example (Department 023 and Project 00000027) are not necessarily required for the time recording process. They have, nevertheless been setup here for illustrative purposes in regards to the vouchers created. For details, please see further below. After setting up the project in FRSI, the employee engaged in company USSI is setup. This setup does not require some special considerations except that it is advisable linking the employee to its department / cost center and intercompany financial dimension, as exemplified in the next screen-print. Setting up intercompany transfer prices for hours recorded is something easy from a pure technical system perspective, as the only thing required is entering a price that will be charged to the other company for the hours worked. From an accounting and taxation perspective things are, however, more complex when it comes to the setup of intercompany transfer prices in an international company environment. This complexity is mainly caused by a number of (sometimes differing) intercompany transfer pricing rules applicable in the countries involved in the intercompany trading relationship. Within the context of this post it is impossible illustrating you even the most basic intercompany transfer-pricing regulations. For that reason reference is made to the general international transfer-pricing framework – the OECD transfer pricing guidelines. Based on the OECD guidelines overarching “arm’s length” transfer pricing principle, an intercompany sales price of 300 USD is setup and used in this example for the subsequent hour transactions recorded. 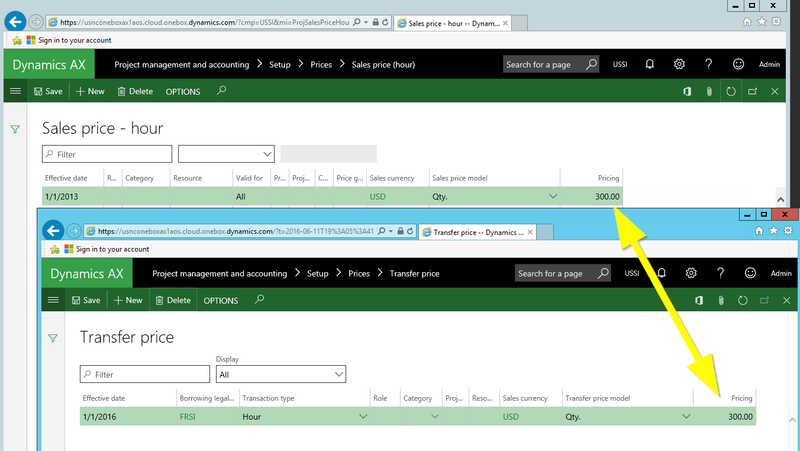 Please note that Dynamics AX allows determining intercompany transfer prices based on the sales price that external customers are charged for through the selection of one of the following (yellow-highlighted) transfer pricing models. With all those setups in place, the USSI employee can record her hours in the timesheet form as usual by referring to the company and project she worked for. Please note that this selection defaults the financial dimension values of the intercompany project in the timesheet form, as illustrated in the next screen-print. The resulting voucher records the cost and payroll allocation in USSI. Notable in regards to the voucher created are the financial dimension values that are recorded together with the cost account (540100) and the payroll allocation account (602100). … the following intercompany invoice voucher results. 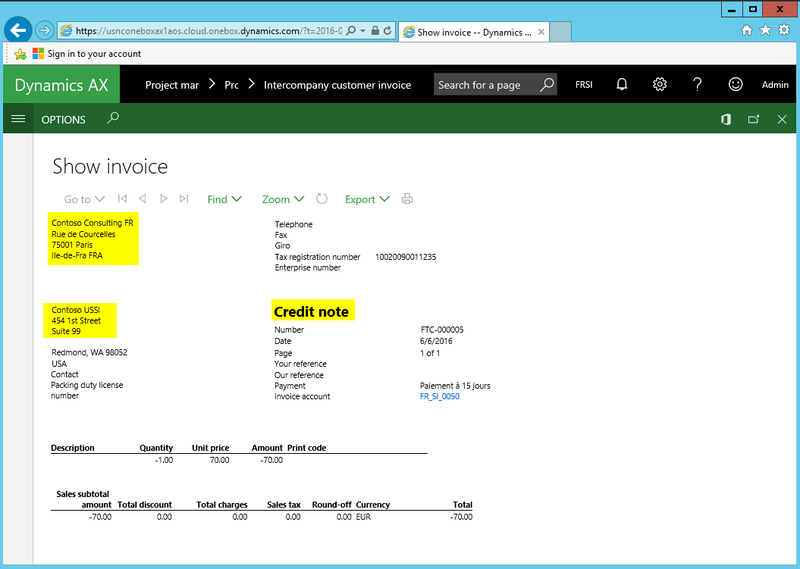 Please note that the intercompany receivable account (133100) is determined by the customer posting profile setup in the Accounts Receivable module. 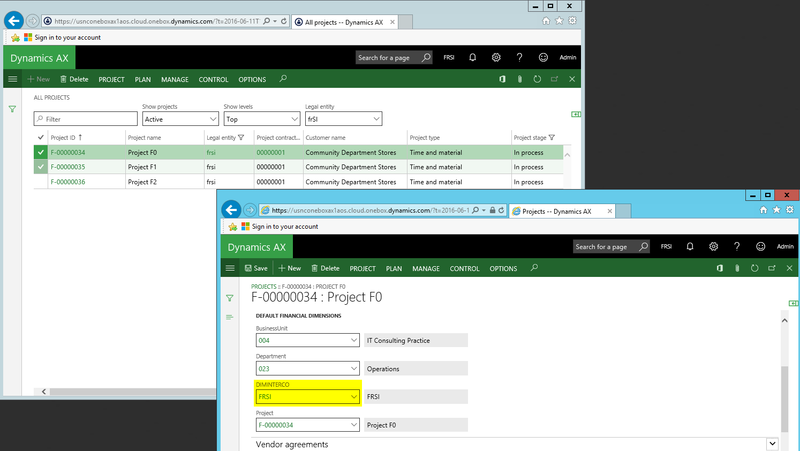 The intercompany sales revenue account (402100) on the other hand, is determined by the corresponding account setup in the project module ledger posting form. 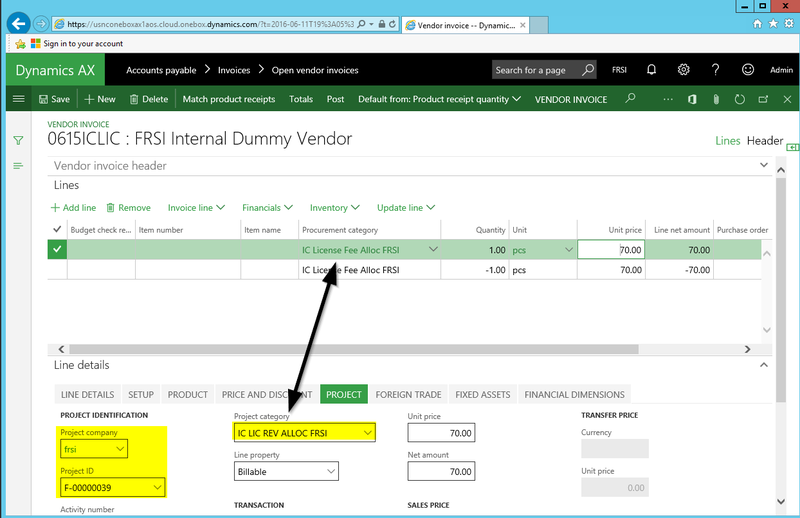 At the time the intercompany project customer invoice is posted in company USSI, a corresponding intercompany vendor invoice is created in company FRSI that can be found in the pending invoice section of the Accounts Payables module. Posting this invoice results in the following voucher. (Please note that the USSI and FRSI companies use different Chart of Accounts). First, that the costs for the hours recorded in company USSI cannot be identified at the project level in company FRSI – at least as committed costs – until the intercompany project invoice and pending vendor invoice have been created. Third, that a comparison of the cost and (inter-company) revenue – highlighted in green color in the next screen-print – allows an easy identification and comparison of the intercompany profit made in the internal transaction. This helps users checking and justifying the appropriateness of the company’s transfer pricing policy e.g. against auditors. Note: As indicated above, the setup of financial intercompany dimension values is crucial for the whole intercompany process. That is because the project module ledger posting setup does not allow specifying intercompany cost and revenue accounts based on companies involved in the trading relationship. Please see the next screen-print for details. 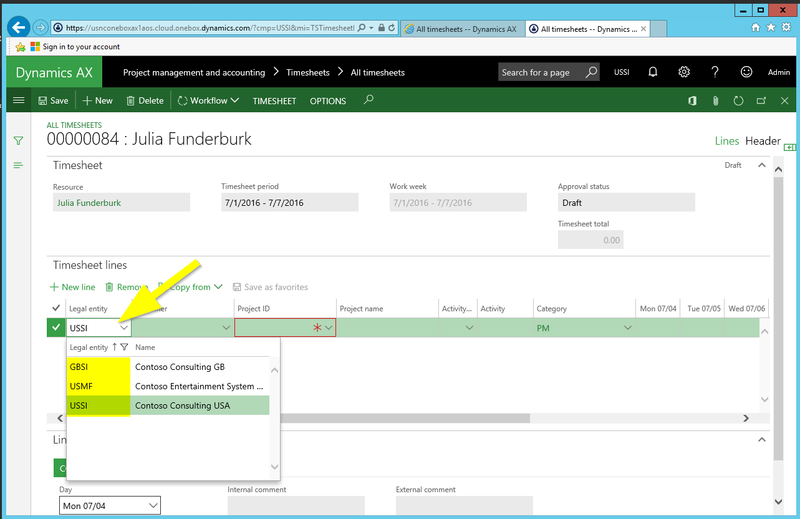 What happens if the financial intercompany dimension is missing at the project level can be identified in the next illustration. The arrows and red highlighted fields above highlight the missing financial intercompany dimensions that cause problems when it comes to the financial consolidation of the intercompany accounts – especially if several companies are involved in the inter-company trading relationship. In addition, also a check of the appropriateness of the intercompany transfer pricing policy will get more complex if the financial intercompany dimension is missing, as the project cost and project revenue postings cannot easily brought together. I hope that this post gave you some new insights into the intercompany timesheet functionality even if you have already heard & read something about this feature before. Against the background of this standard functionality, let’s continue then by having a look at some other, more complex, project related intercompany cost allocation scenarios in the next part.